The following is an op-ed (opinion editorial) written by Alanna Hendren, Executive Director of the Developmental Disabilities Association. 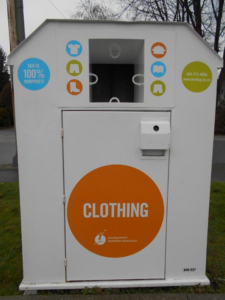 Due to the recent tragic deaths of a man in a clothing donation bin in West Vancouver and a woman in Toronto, municipalities are justifiably concerned about the threat of such bins to public safety. The Developmental Disabilities Association has successfully operated a bin program in the Lower Mainland since 2002. We are grateful for our partnerships and would like to assure the public that we have removed all bins with “rolling” chutes and replaced them with “open chute” bins. There has never been a fatality in an open chute bin, since people can climb out of them. In the cities where we have had the opportunity to present this chute design, we have received approval for use. DDA has no unlicensed bins on city property – they are all hosted on private property through agreements with property owners. Since community safety is a top priority for our association, we have been working with Dr. Ray Taheri, Professor of Engineering at UBC Okanagan regarding bin design. We intend to continue working with him to further improve bin safety. Our collaboration has so far resulted in a competition where engineering students presented prototypes for potentially safer designs. We are encouraged by the innovation and ideas that have resulted so far. A major benefit of clothing collection is the diversion of re-usable items from public land-fills. Millions of tonnes of waste are diverted from land-fills by charities – at rates of $90 to $142 per tonne in disposal costs in Metro Vancouver, clothing collection bins reduce municipal garbage costs and save taxpayers money. DDA alone diverts over 6 million pounds (2,722 tonnes) of clothing and housewares from the waste stream annually. This type of re-use and recycling is needed now more than ever due to the advent of “fast” or “throwaway” fashion. Consumers are buying more clothes, wearing them less and disposing of them at an unprecedented rate. Clothing is the fastest-growing category of waste today because the apparel industry stimulates demand through massive marketing campaigns, shortens the time it takes for an item to get from the runway to retail and uses cheaper materials and production methods to allow people to purchase clothing at costs low enough to throw away quickly-dated trendy items. Another challenge to the environment is that natural fibers are rarely used anymore – most are mixed with synthetic materials that do not decompose. The proceeds of our clothing collections are entirely used for the benefit of people with developmental disabilities, augmenting areas where governments have decreased their commitments to funding. Other charitable textile collectors like Diabetes Canada, Big Brothers, and the Salvation Army use their profits to fund summer camps, diabetes awareness programs, medical research, mentors for children, and support people living in poverty. Together, our efforts positively impact millions of Canadians every year. It is up to the public, through its elected representatives, to decide whether the benefits of clothing bins outweigh identified risks, but we must also understand that the problems driving people into clothing bins and dumpsters – poverty, addictions, mental illness and especially homelessness – need urgent attention and public support if we are to reduce the needless suffering and deaths of our fellow citizens everywhere in our communities. Charities like the Developmental Disabilities Association are here to be part of the solution.